I’ve been going to church my whole life. Now I help lead one. I guess that qualifies me to know stuff about going to church. It occurs to me that while church might be totally normal for me, it’s freaking weird for people who’ve only been into churches for special events like Christmas, Easter, baptisms and christenings, weddings or funerals… but it also occurs to me that there are people out there who might feel like they’re missing something in life; be it community, or a connection to a deeper spiritual reality, what Christianity and this Jesus stuff is all about (and why so many people seem to believe it is true), or perhaps you just want to figure out what church is so that you know it’s not for you. I don’t think many people are choosing not to go to church because they’re worried about what church will be like, but maybe you are? And maybe this could be helpful. Maybe you’ve never thought about this until a weird link popped up on your Facebook feed. Maybe this is a sign from God (or Facebook’s algorithms have calculated that you really need church). Maybe you don’t know what you’re missing, but you know you’re missing something. A cool thing I read recently suggests the average person in the modern secular world we live in is, whether they know it or not, haunted by our modern world’s decision to toss the God stuff out of our public and private lives. So maybe you miss church without even knowing it? Maybe you want to know why I, or people like me, give up the best hours of the weekend to hang out with people who aren’t much like us. This post is designed to help you figure out what to do about that haunting feeling, to satisfy your curiosity about church, or know how to react when a well-meaning Christian friend invites you to church and you want to humour them. It’s comprehensive, and has headings and bolded bits, so you can scroll up and down to find things you want to know before heading to church. If you don’t need any of this stuff, why not try church somewhere near you this weekend. Make a day of it. So you’ve decided to go to church. This stuff is easiest if you’re going with someone and you have a specific church to check out. But let’s assume that’s not the case. Most churches worth visiting have a website, some use social media. A website will give you a sense of the personality of the place, so will a church’s Facebook page and the stuff they choose to share. Especially photos. Especially photos of people. If you’re really serious maybe search for the pastors/ministers/leaders on Facebook and see if they’re totally weird. You’ve got amazing tools at your disposal to get a sense of what church will be like before you get there. Sometimes these websites will use weird insider language, but most are pretty good at trying to help you figure out what to expect if you head along. Believe it or not, churches love visitors. Some of us are still trying to figure out how to speak to an Australia where a significant majority of people say they’re Christians, but a greater majority never ever go to church. Sometimes our language needs translating and it’s like visiting a foreign country that occasionally speaks english. But churches love visitors. We pray for people to come. We want people to know Jesus — not because more people believing in Jesus will make us feel weirder, but because we think Jesus is good news, and good for you, and Jesus tells us to love our neighbours. If a church doesn’t strike you as sounding like it loves visitors. Don’t go. I’d rather your experience of church is one where you feel like people really want you to be there with them. Some jargon worth knowing about — most churches call their meetings ‘services’ — this is because for some churches what happens on a Sunday is worship which means ‘service of God’ and for others it’s because the aim of the gathering is to serve each other, and our neighbours, by helping people know Jesus. Most other jargon isn’t worth knowing; the most loving thing us churchy types can do for you is be clear about what’s going on, what we’re on about, and what you can expect. This one isn’t for everyone. But if you’re going alone and you want people to be looking out for you — get in touch with the church via the website. Ask questions you want answers to. There aren’t stupid questions. Sometimes going into a church feels like going on an overseas holiday (you don’t need a passport though). This just isn’t true. When Jesus was around the ‘good people’ got upset at him for hanging out with sinners; he said “it’s not the healthy who need a doctor, but the sick” — church is for people who know they’re broken, not people who think they’re too good for everyone. We sometimes get that wrong though, or have developed such ‘good habits’ (like not smoking, swearing, or other normal stuff) that we might seem to have things more together. We don’t. Plus. Hopefully Christians know everyone is at a different stage of figuring out the God stuff; a good church will explain stuff as it happens, and be patient with you as you figure stuff out. Every church building I know of meets the building code requirements, so roof collapses are unlikely. Some churches don’t even meet in ‘church buildings’ — for the first few years we meet in a theatre where all sorts of stuff happens (with plenty of stage designs). You’ll be ok. Hopefully people won’t be judging you either; Jesus tells us not to. Nah. Christians who know what they believe will absolutely be there. But church gatherings are for everyone. Some churches focus on teaching Christians and assume you’ll catch the vibe eventually, others are more deliberately on about making church accessible for new people (assuming Christians become better Christians by loving other people). You should definitely come. And ask questions if you don’t understand stuff. And ask more questions. Hopefully the church you visit will be friendly. Church isn’t a place, or a brand, or even the event on a Sunday though we might speak of ‘going to church’ — the church is the community of people, not the event. You can visit a church service, but church, ultimately, is a community you join not an event you attend. We should be on about breaking the consumer mentality so common in our approach to events and focus instead on loving and serving each other (and you). Christians don’t ‘go to church’, we ‘are the church’… and not just on Sundays (and not just when we are meeting together). This stuff is a bit confusing, but it might explain how the word church gets bandied about when you’re there. Most Aussies have some sort of family ties to some sort of brand of Christianity, it’s not uncommon for me to say “I’m a Presbyterian” (not up front, when people ask me if I’m part of a cult or something), and to hear the response “I think my grandma was Presbyterian so I guess I am too”… that’s not really how it works. Sometimes these brands (called ‘denominations’) have big differences in beliefs and practices between each other; other times its more a question of where the brand originated (Scotland for the Presbyterians, England for the Anglicans). All these churches do stuff differently, but most of the time there’s a diversity of practice within them and the descriptions are now mostly about boring stuff like governance. Stuff you won’t have to worry about for at least the first year or two… but most churches will be able to explain what they’re on about, and most churches will be more than happy for you to figure out what you’re on about if you decide Jesus is for you. Clothes. Shoes are optional in most churches. But definitely clothes. The idea of ‘wearing your Sunday best’ is probably an idea best left in your parent’s or grandparent’s generation. As a preacher I aim to be dressed about as well as the average attendee, I don’t want people to think they have to play dress-ups. Just be yourself. Part of the measure of a church is if they’ll accept you and welcome you as you really are, not as you pretend to be. On time. Probably. Getting there early will give you a chance to meet people — most churches have a team of people whose job it is to welcome people and make life easier for visitors. Some don’t. Hopefully if you get there early, people will talk to you (I say this as an extrovert). Most regulars at my church show up within the first 15 minutes after the service starts. That’s not necessarily the best thing for them to do, but life happens. Kids throw tantrums. We understand and we don’t make a big deal about people being late (being on time or early just frees you up to be there for other people, and visitors). Find the nearest exits. Do whatever your basic spy training taught you to do when in an unfamiliar environment. What you do once you’ve arrived is up to you. If you’re there early you can practice the ancient art of hovering to see if any interesting conversations come your way, or you can find a seat (someone may approach you to say hi there too, church people love saying hi, and asking you ‘what do you do?’ It’s such a boring question. Sorry. Freak them out with an interesting answer. Some churches will hand you a Bible, and/or a bit of paper, on the way in. The paper will usually try to help you know what’s going on a bit on that Sunday, but it’ll have some info in it for people who are part of the church too (maybe news, or info about church finances). It might be worth grabbing so you’ve got something to read in the boring bits (that might or might not happen). There may also be a contact card so that people from the church can follow you up to answer any of your questions or find out what you thought about whatever happens; you can either fill it in or make a paper plane, it’s up to you. What’s going to happen in the ‘service’? Every church is a bit different. Some churches will let you know what is going to happen on a Sunday on their website, others might print something in that paper flyer thing they hand you at the door. Here’s what I think most services/meetings/gatherings/whatever will involve. Some singing. Christians love to sing. The Bible tells us to do this and singing is a great way to participate in teaching each other, and in planting ideas in a poetic way in our heads so that we live a certain way during the week. Songs help us follow Jesus and encourage each other. Plus they communicate thankfulness to God (who we believe is real, and is there with us all the time, but we’re paying particular attention to that as we get together). Singing is a bit weird. Most of the time people will stand to do that (because you sing with more gusto when you’re standing); it’s not entirely silly to think of some songs as being a bit like a national anthem (that communicate something about who we are and what we value) and like what happens at a Liverpool game when the crowd sings You’ll Never Walk Alone. Something for the kids. Good churches want kids to know who Jesus is too — there’s a great story about Jesus interacting with a bunch of kids that shows kids are really important to Jesus. Kids are people. One way Christians talk about church is that we’re the ‘family of God’ — so kids are part of church not some sort of weird extras or annoyances to be swept under a rug somewhere. I love when kids are kids and they make noises and stuff during the service. My kids go a bit stir crazy and dance and run around. That’s cool (not all churches will be so fine with it, not all of us have little kids). Most churches will have some sort of Sunday School and some will have a spot before the kids head out to their program that helps parents know what is going to be talked about in that program. Some will sing a kids song. Christians have a weird love for puppets, so there may be puppets too. More singing. There might be a break in the service at some point where the kids head out to their thing, some churches will use this as an opportunity to talk to people. New people. People like you. Be prepared for some more small talk; but remember, the people talking to you are probably as scared of you as you are of them. They’re trying to welcome you so that you get a sense of what’s going on. They might actually really genuinely love you; hopefully they do. And that could be the start of something profoundly amazing like real friendship. Some praying. We believe we can talk to God. Which is a weird thing that might be a bit confronting. But part of why we get together is to pray together and to recognise God for who he is — for Christians that means talking to God as the one who created everything, who is ultimately in control of everything, and who saves us (that’s the Jesus bit). Some Bible reading. One of the other things we believe is that God talks to us — and that he does that through the pages of a 2,000 year old book. This, again, might seem weird. But nobody claims we believe totally natural stuff; we believe the supernatural is natural, and that a book that old can say things about life now. Churches read and understand the Bible differently and understand the truth it contains differently. Some people think everything is literal, some that everything is metaphorical, some that you should read and apply the Old Testament directly to life now, others that you have to understand the Old Testament in the light of the New Testament… ours, like some others, thinks that the Bible is all about Jesus, that it tells one story from start to finish; the story of God saving the world. A talk. Someone will get up and hopefully they’ll speak about the Bible passage that was read, and about Jesus. Hopefully they won’t go for longer than 20-30 minutes. Food. Churches often have coffee and morning tea or lunch floating around after the service. If you like the idea of hanging around with the people you’ve sat with for an hour or so, then you should stick around. This is a good chance to ask questions about anything that happened or anything anyone said so that you don’t go home puzzled for weeks by the strangeness of it all. People love answering questions. Sometimes there might be some other things going on — baptisms and communion — hopefully these will be explained as they happen, but they’re not every week things in most churches. Some churches do a weird thing called an ‘altar call’ at the end of the service where they ask you to come down the front if you’ve decided to follow Jesus. The thing is, you don’t need to come down the front of church to decide to follow Jesus you just have to believe that he’s who the Bible says he is — the divine king of the universe — and decide to follow him. Altar calls have always felt a bit sales and marketing 101 to me, but some people like them, and lots of people have started following Jesus by walking down to the front after the service. Give feedback. So you’ve been to church. Did you like it? Tell someone. Did you hate it? Tell someone that too. Or don’t. But it’d be nice for your friend to know what you thought, they’ll be wondering; and churches like to hear about how the experience was too. Ask questions. If something wasn’t explained well, and you’re offended or curious, ask someone what it meant. Maybe we’re bad at explaining ourselves, maybe we’re weird, maybe it was some strange jargon that we have forgotten is weird, or maybe we’re offensive — but remember, this post is for the curious, so be curious. 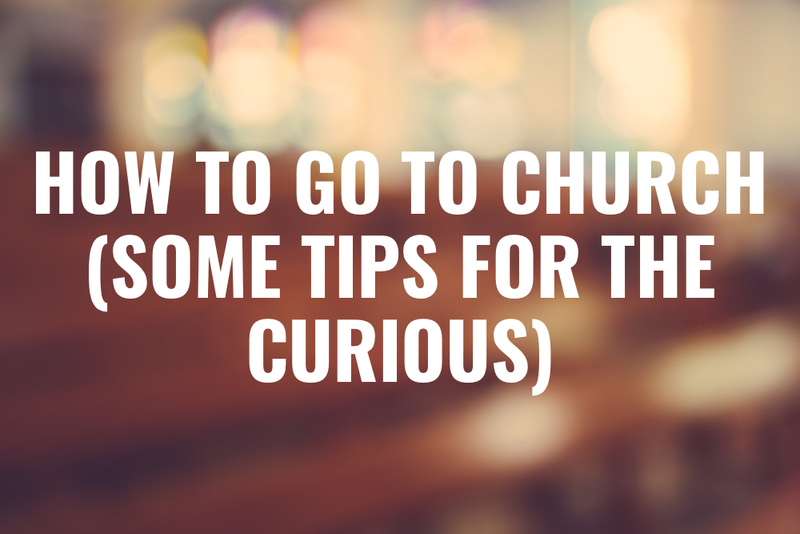 Think of your trip to church as though you’re a tourist wanting to figure out what’s going on. Find out more about the community. Since church is a group of people not an event you don’t just go to church, if you like the Sunday thing, and the people seem friendly, and you want to know about Jesus (or any two of those three), the next step is to find out how to be part of the church community (some churches do feel a bit more like events than communities). A switched on church will be keen to help you do just that, this might look like what churches call ‘small groups’ or ‘home groups’ or ‘cell groups’ (it’s not a prison thing). These groups are a good chance for you to meet people and ask questions, but joining them can be pretty intimidating; when you join, and if you join, is up to you, but they’ll be on the agenda at most churches so it’s good to know what people are talking about if they use those words. I’m a big fan of small groups and the idea that you really understand a church community when you see how people meet in homes and in small groups not just in the polished ‘event’ on a Sunday. So if you’re curious, definitely check them out. You can always leave church stuff at any time (that’s why it pays to know where the exits are). Follow up stuff. Going to church is a bit like dating; and when you think about it, it’s potentially a pretty major relationship decision. For the church, knowing if or when to call after a first date, or whether to play it cool with an email, a Facebook message, or an SMS, is a bit of a guessing game based on how well people got to know you and the chemistry or whatever. There’s a good chance that if you give someone your details, you’ll be followed up. Don’t freak out. If you’re not interested, just say that. Ask them politely not to contact you, or make it clear you’ll initiate contact if you want to know more or pursue a relationship. If you are interested, try a second date, even on your terms, arrange to chat with some people at a cafe or somewhere, or just head back next Sunday. But you might have questions about going to church that this post hasn’t anticipated. Ask them here! Church is actually pretty great — the community, not just the event, and the life-changing story of Jesus is greater still. Great enough to get people hanging out with each other from across different social demographics in places all over the world, over 2,000 of history. It might be worth checking out. Who knows. It could change your life.